1. 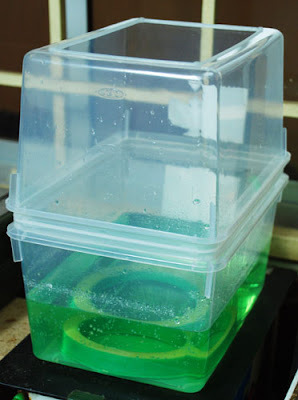 Pour 1 bottle (450ml) of H2O2 into PLASTIC container. 2. Add 300ml of muratic acid. 3. Mix thoroughly and let it settle. Do not close the container as the reaction will produce some gas. 4. You're ready to etch! 5. After SEVERAL etchings, the solution will become dark green and later brownish. 6. That's when you need to add oxygen. You do that either by air bubble (aquarium air pump) or by adding some H2O2. 7. When it become hard to re-green the solution, add some more muratic acid. Since I use the air bubbler DURING etching, I need not do step 6. I only do step 7 as needed. Last for eternity? Also no idea. Not much PCB making lately so cannot really test the solution longevity. Will update on how well it stores later. The hydrogen proxide is from normal pharmacy-- RM11 for 450ml. 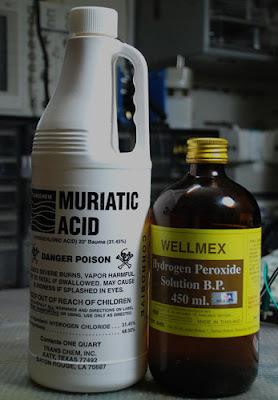 Not sure which hardware shop sells the muratic acid but at Ace Hardware, it cost around RM10 for 1 bottle (~950ml). Last my patient death cause by hydrogen Peroxide... exposure more than 20ppm also can coz cancer in short term. Care to explain the health hazard of hydrogen peroxide? My search so far show that it is safe (even as mouthwash) at low concentration (which is much higher than 20ppm). Here a link I found that links to many other.